What are we to make of this articulate, intelligent, and influential person’s use of the word wow? That it was this word he uttered, not another, at this momentous time. We hear and say it all the time. I think we use it mostly unthinking. It’s a word that can fill a void. But it can also express precisely how we feel. When we are surprised by something or someone we say it. When something impresses us we say it. Wow, that’s great. Wow, you’re great. Wow, I love it! And as bored as I am with amazing, when paired with wow, it is omnipresent. Wow, that’s amazing! Shakespeare himself uses it (just a few centuries earlier) in Ariel’s Song in Act One from “The Tempest,” when the spirit, Ariel, guides Ferdinand with her voice. “Hark, hark! The watch-dogs bark. Bow wow. Hark, hark!” Here it is connected with bow to reference the sound a dog makes. Wow has a sense of wonder about it. It is a palindrome (spelled the same backward and forward). And it is onomatopoeic. It sounds just like what it means. And when you say it, your mouth opens and you look like you are in awe! It simply implies awesomeness to the nth degree and then to infinity. Wow. Back to Steve Jobs. Was it a feeling of wonder at being welcomed into the cosmos? Was it seeing all his loved ones around him? Perhaps he was thinking about his life’s favorite moments. Or his achievements. Maybe all those beautifully designed and technologically sophisticated iPods, iMacs, iPhones, and iPads made a final farewell appearance. That a sensation of wow was clearly how Steve Jobs felt at what his sister calls his “still more beautiful later,” then no word conveys a more promising message courtesy of this singular communicator who left behind a communications brand like no other. 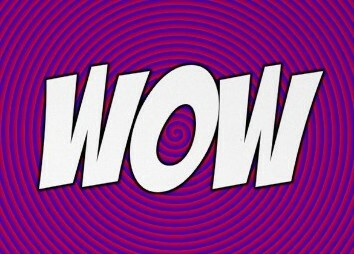 Wow indeed.